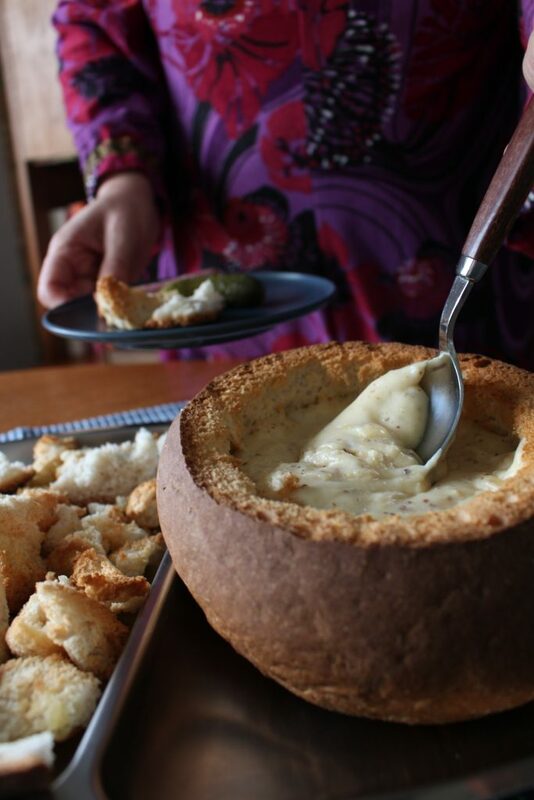 An easy yet indulgent cheese fondue using a mild cheese and cider instead of kirsh for a simple treat to share round the table. The ultimate retro classic with an up-to-date twist. Whether you remember the 1970s or not it was a time of change: new labour saving devices, women returning to the world of work and a general sense of striving forward breaking all the rules. I don’t remember much of the early 1970s but I do remember that feeling of a warm cosy house filled with cooking smells and running around in bare feet leaping over sunbeams as they hit the carpet. Not to mention the exhilarating mix of décor colours! Home was comfort. Home was a good place. Home with its simple pleasures – no daytime TV or mobile devices just a haven to play board games, colouring books and dolls was fun. So whilst staying at Dimmet, a 1970s bungalow in North Devon I wanted to recreate a dinner party dish that my parents would regularly host. 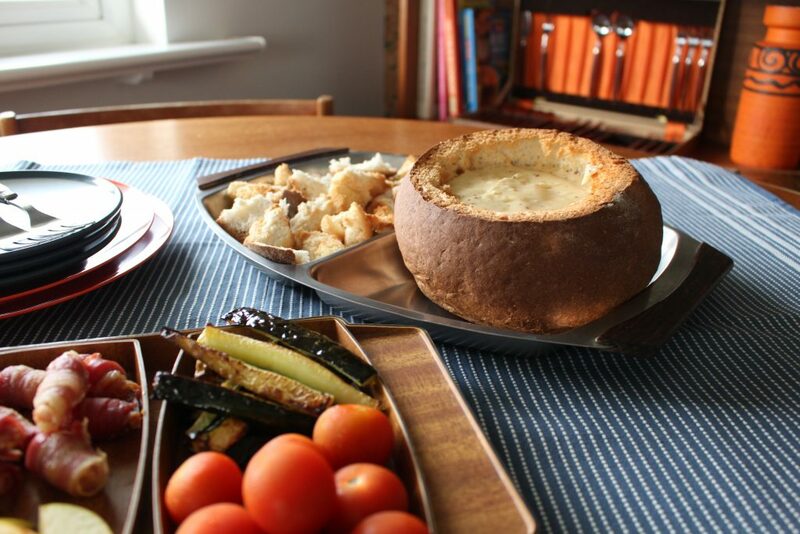 I cooked a Cheese Fondue with lots of delicious tasty bits to eat alongside the traditional cubed bread. Dimmet is situated in the seaside town of Braunton with it’s sweeping sandy beaches, rugged cliffs and a surfing meca. The 2 bedroomed bungalow is decorated resplendently in 1970s colours whilst keeping the kitchen, bathroom and beds safely in up to date comfort. We sat for hours chatting about our childhood memories and laughing at our tales of grazed knees (husband) and tearing around and getting told off (me). I do remember cheese fondues to be like boiling hot vats of bubbling melted cheese with a floating layer of pure alcohol and thinking I’d just stick to the bread thanks. So I decided to make a much easier, tastier and less stressful version. 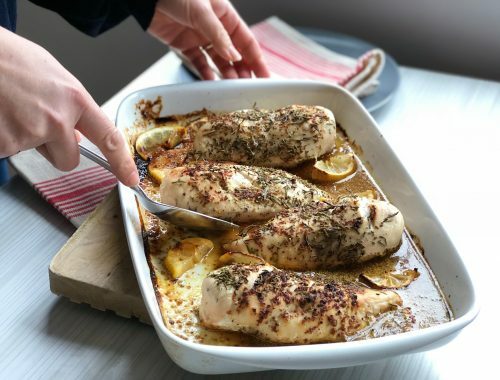 This dish can easily be reheated so you can make it in advance without fear of it splitting. Slice the very top of the loaf of bread and pull out the inside leaving a good crust to act as a serving dish for the fondue. Drizzle over 2 teaspoon olive oil and smear around with the back of spoon. Place in the oven to bake for 10 minutes. Cut up the ripped out bread into large chunks. Place on a baking tray and sprinkle over olive oil and season with salt and pepper. Bake for 8-10 minutes until golden. In a saucepan, heat the cider and garlic clove until starting to boil. Toss the cheese in the flour and then add to the pan with the cider. Keep stirring until melted and bubbling. Add the mustard and Parmesan and continue to cook for a further minute. Pour into the cooked bread loaf and serve with grated nutmeg over. 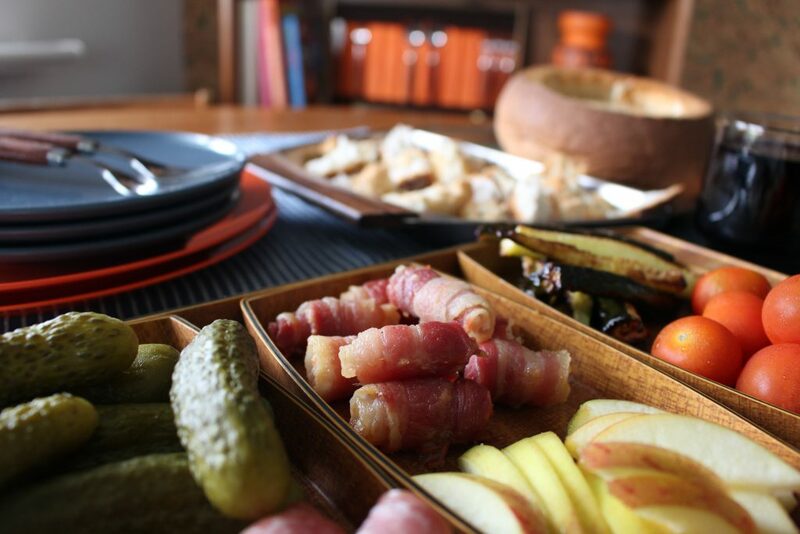 Serve with rolled up salami slices, gherkins, cherry tomatoes, griddled courgettes, rolled up bacon slices and apple slices. Thank you Emma and Andrew for allowing us to stay at Dimmet. For a completely different holiday, Emma and Andrew also have a shepherd’s hut in Somerset, see my stay HERE. This looks yummy! 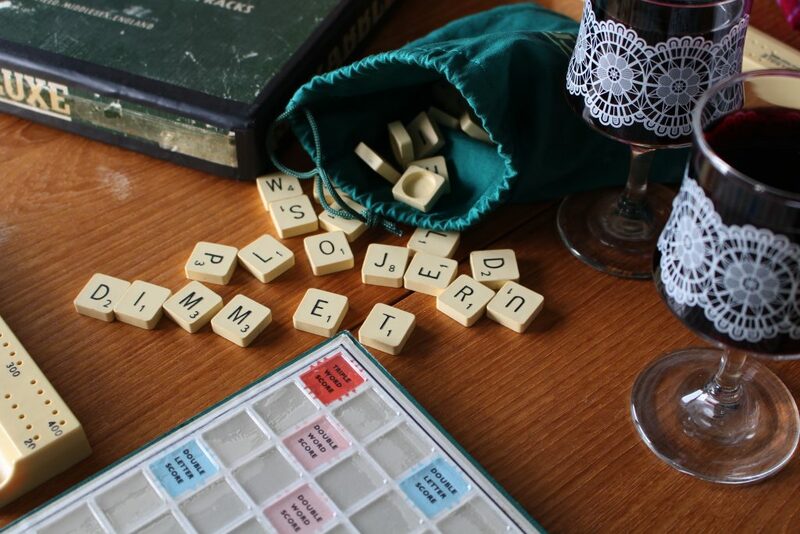 We never had cheese fondue when I was younger and I think I’ve only ever had it a couple of times but I would so much like to try this and your weekend in Dimmet sounds so relaxing too – I’m envious! 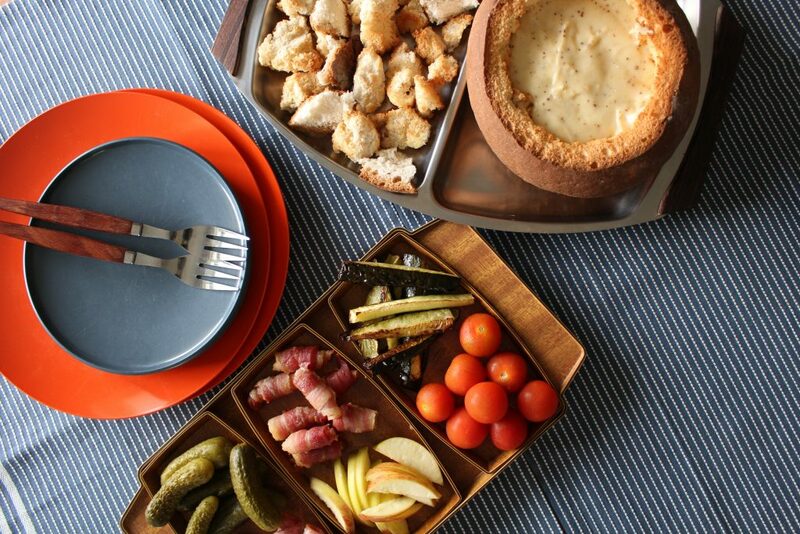 I LOVE a fondue you have inspired me to get ours out this weekend and damn the diet. 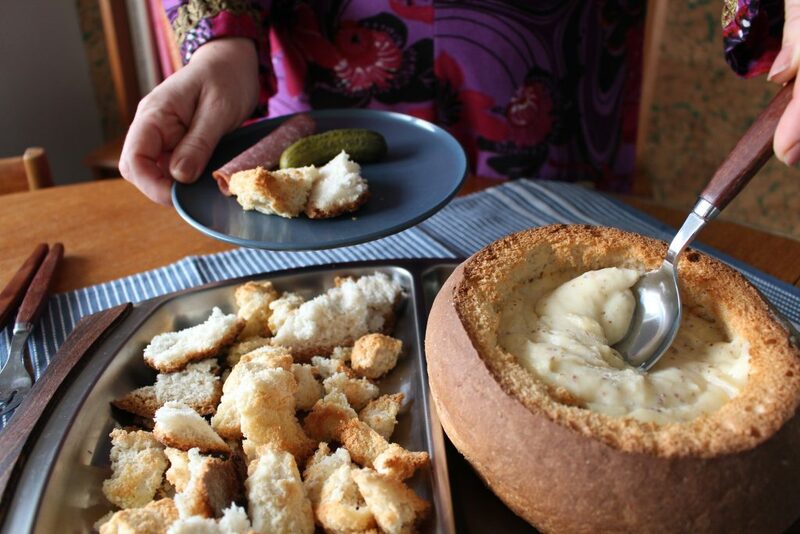 As a child of the 70’s, I love cheese fondue! Now I’m craving some! I need to get my fondue set out, dust it off and have a fondue party. Thank you for making me drool. I just LOVE cheese fondue. I’ve never tried to make it on my own before. I should! When I think of fondue I always envision that contraption with the metal skewers that we couldn’t touch because it was hot. Now flash forward and here I am all about the fondue. Some good cheese, some good wine and hunty we have an appetizer they’re sure to rave about. Fondu and bread bowls are making a come back. They are really easy to do for a small or large party. They are so many ways to go with fondu it can be tons of fun. This is SO incredibly retro and I totally love it. I should surprise my parents with a meal like this. They would surely appreciate it! 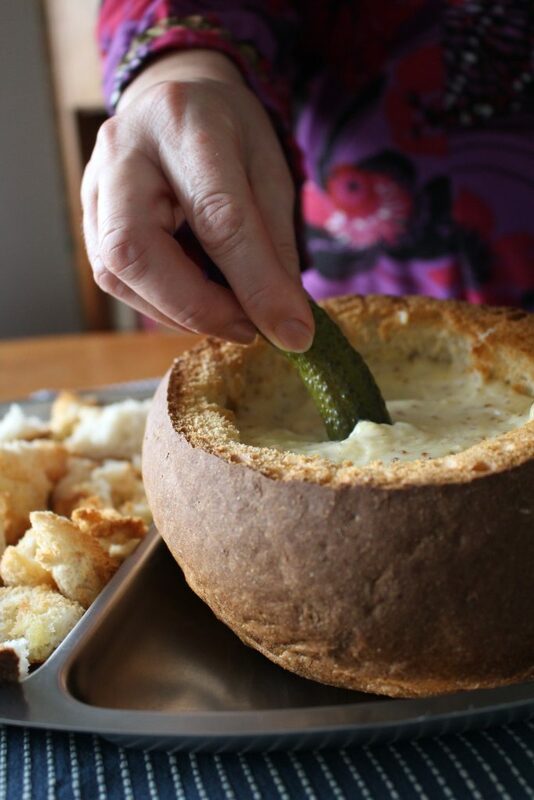 Now this is amazing, I love the idea of a bread bowl for a cheese fondu as well – I totally need to try out something like this myself! I haven’t had fondue in a long time. 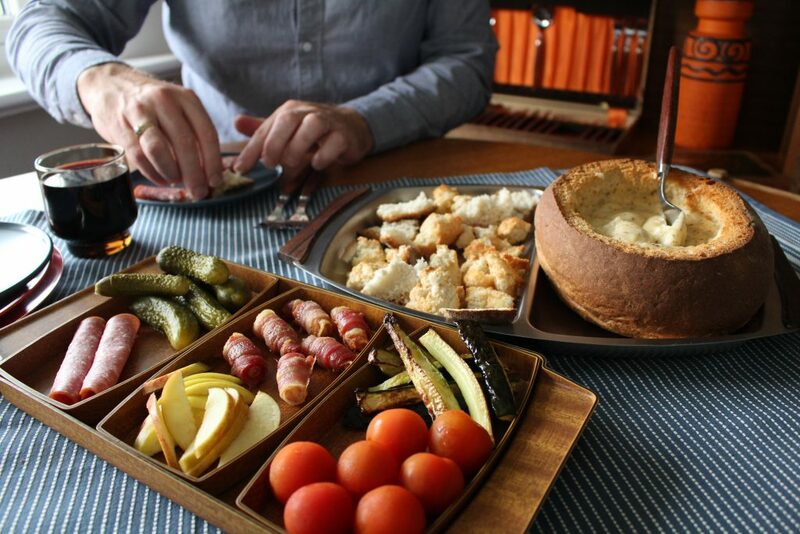 THis post is reminding how much I love making and eating fondue. Maybe I’ll set up a fondue party soon with my friends. I haven’t had cheese fondue in ages, for many, many years. My Mom used to have a small thing she made it in and it was a fun snack. I’ve been wanting to try the cheese fondue from a nearby restaurant but it is expensive. I think I can pull this off, thank you for the ideas! This looks like so much fun. I have always wanted to have a fondue party. We love to do fondue on New Years. 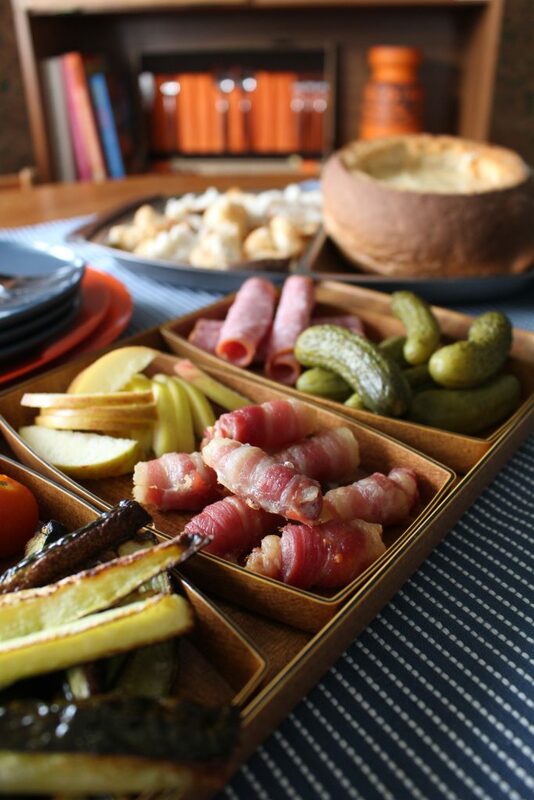 We have our friends over, start the Raclette for the savory part of the event and then move into the fondue for the dessert portion. It is a great way for everyone to be a part of the party. I can’t believe I have never made cheese fondue before. That set up looks fantastic! Yes, this looks amazing! Now I want some too! This would be great fo my Christmas party I’m hosting! That looks amazing! I love a good fondue especially on a chilly fall or winter night. Comfort food taken to the next level! I love how the food presentation it really came out nice. Soup and veggies are the main meal right now in our house hold. 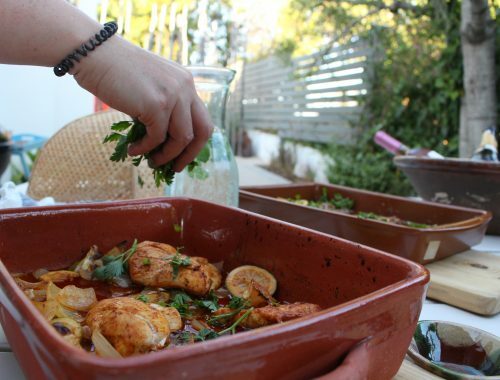 And I definitely want to try this, can’t wait to shop tonight and have it ready for dinner time. Wow, this is a great idea on what to prepare during get together parties with friends or even when I am doing a movie marathon. I am printing this now to add on my recipe to-do list. Glad I came over this post. You have no idea how much I love this fondue, I am actually salivating LOL. 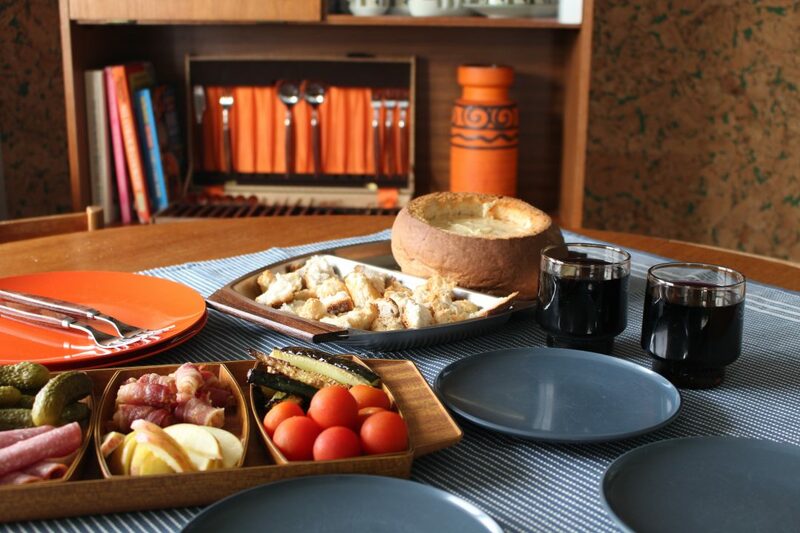 Reminds me of my childhood and the fondue set my parents used to get out regularly – but a loaf looks like a great idea instead! OMG now you are really dating me. I remember those fun dinners all too well. What a great way to entertain. Maybe we should bring it back!! Do you remember the “hot rocks” too. Another fun way to eat with friends for dinner. Fondue is so much fun! Thanks for a great dinner idea! Out of curiosity, what brand of gluten free flour did you use? I’m a recently diagnosed Celiac, so I’m still learning which flour is good for what. I’m wondering if any flour would work, or if one without xanthin gum would be better? I have never heard of Caerphilly cheese before. I am going to have to go on a hunt and give this a try! I always associate cheese fondue with Christmas eve. Whenever we are in Europe for Christmas we do just that but I have never tried it in a bread bowl. Also I am used to a mixture of 3 cheese such as Gruyère raclette and emmenthal together with some white wine. I would love to try your version with cider for a change! Cheese is one of my favorite things in the world, so of course I love fondue! I also love the idea of putting cider in it. I can’t wait to try this variation. What a fun idea! I love your photos here too 🙂 I’ll have to try this soon! I don’t each much cheese fondue or any cheese appetizers actually. I probably wouldn’t even know where to begin even if I wanted to make it. I am going to pin your recipe for future reference because it sounds simple enough to make plus it looks delicious! This fondue looks SOOO GOOD! My mouth is watering!! I haven’t had a fondue since Switzerland years ago! A great sharing dish always with such laughs! This version sounds lovely! 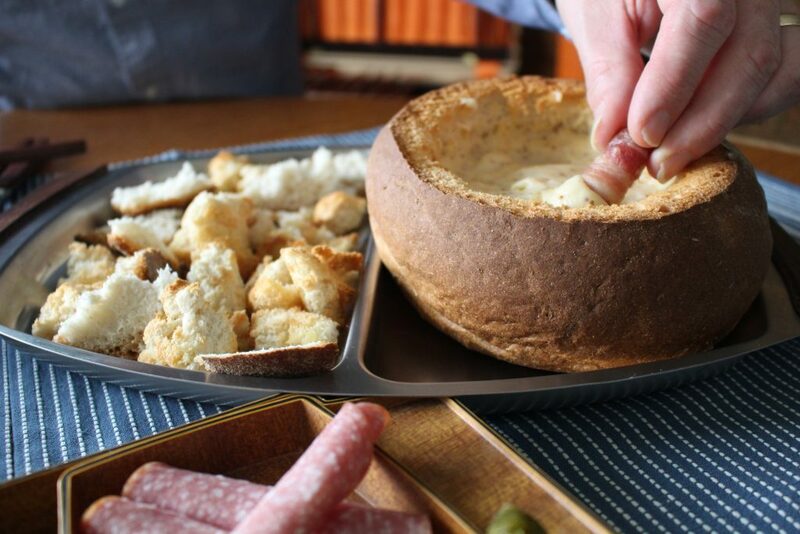 As a kid, I loved when we had “fondue parties” in the 1970’s – how can you not have a good time dipping in warm cheesy goodness? 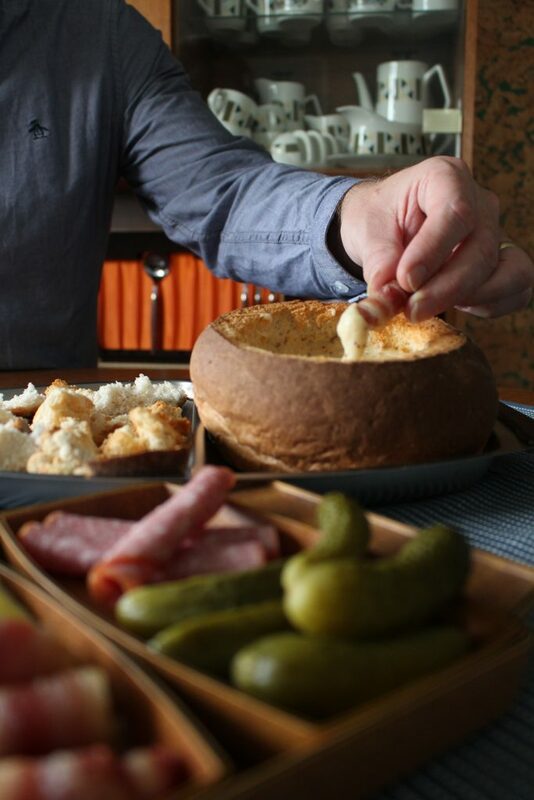 I have never done cheese fondue – always thought it’s very complicated. But you make it look super simple. Thanks. Will try it soon ! I absolutely love cheese fondue but must admit that it’s the only food I eat store-bought. I did have a try of making my own and it failed miserably. I ended up with a large hard ball in my pan. No clue what happened there but I was gutted to have to throw it away. 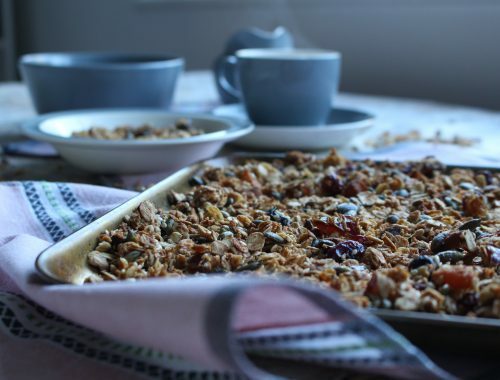 This recipe looks fairly easy so I think you just gave me a good reason to give it another go! How fun! 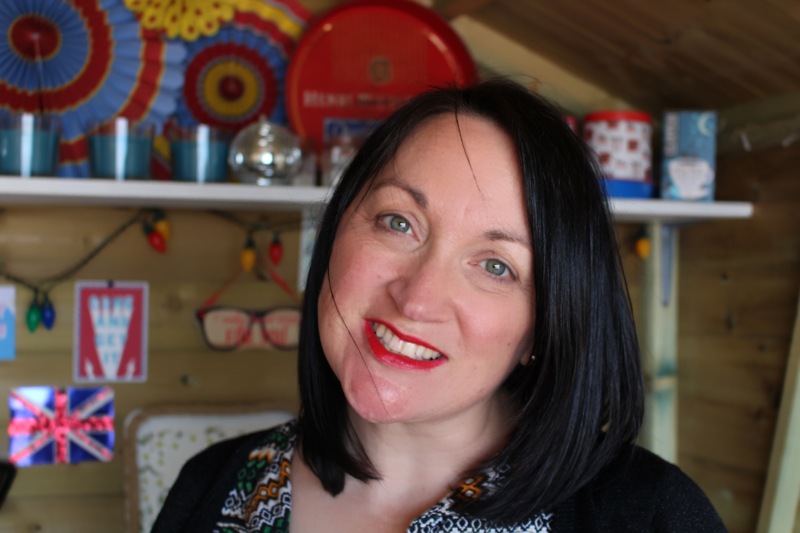 I love making vintage recipes or foods inspired by vintage recipes! Fondue is one that I haven’t tried yet! Sounds like a great party making kit! I absolutely love cheese fondue! It’s one of those things I only ever eat when I go to the Alps, but your version sounds perfect as a more regular treat! I love the fact it can easily be reheated rather than requiring another piece of kitchen equipment like the traditional fondue requires. Thanks for joining in with #FreeFromFridays.